Chevy Blazer being towed from Sunday Morning crash site. A one-vehicle accident at about 8 a.m. Sunday morning damaged a downtown New Albany building and sent the driver to the emergency room at Baptist Memorial Hospital. The extent of the driver’s injuries is not known, but they are not believed to be life-threatening. 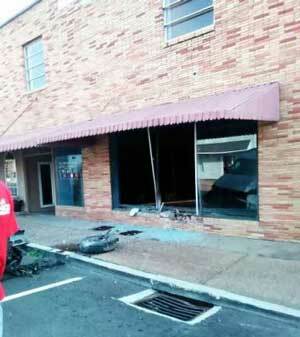 Downtown building damaged in one-car accident. The driver of a 2002 Chevrolet Blazer SUV told police she had worked all night at her job in Tupelo, and she believed she had fallen asleep while driving. The SUV driver was traveling west on Bankhead Street and apparently awoke to see she had veered into the eastbound lane of the street. Seeing she was about to strike an eastbound vehicle, she apparently overcorrected and crashed into the building. New Albany Police Chief Chris Robertson said the eastbound vehicle was not struck during the incident. The damaged building is on the north side of the street at 107-109 East Bankhead. City fire department and code enforcement officers checked the building for structural damages. The building was not occupied, and it is reported that no active businesses are located there. On Sunday afternoon, workmen made temporary repairs to the building damaged in the single vehicle accident. Poolville murder story updated: victim, shooter identified.